I have been lucky enough to have an iPad in my classroom for the past academic year and myself and my students have enjoyed discovering its potential. Our department were then, after having submitted a written proposal, given 20 iPads for use in our classrooms and as a consequence I have been busily spending lots and lots of my free time deciding which apps to use and install on our iPads. This list is by no means exhaustive but it will certainly be my starting block. After reading a LOT about apps I have followed advice and gone for generic apps rather than subject specific ones. Google Drive – all our students and staff have a gmail address and a Google Drive so this is really a no brainer. It will allow me to share documents with my students and it should help when giving feedback. Evernote – much though the whole island has gone Google I have to say that I rather like Evernote, whereas I often find Google Drive clunky especially in the app, I find Evernote to be slick and very easy to use. Furthermore, students can email documents to your Evernote via your Evernote email address, they can type @ and the appropriate notebook’s name in the subject line and they can even tag it for you using # and the document is instantly filed in the correct notebook for you and tagged so that you can easily find it – what’s not to love? Evernote Peek – this clever little app allows you to make quizzes. Students lift a small portion of the ipad cover to reveal the question and then the whole cover to reveal the answer – it’s ace! Don’t worry if your iPads don’t have a liftable cover there is an electronic one provided by the app. Infinote and Sticky Notes – My students go through reams of Post-It notes when they are revising for their controlled assessments, now we will be able to use an electronic version. Fotopedia – Lovely photos of UNESCO world heritage sites, great to show your students some of the amazing places that exist in far flung lands and closer to home too. Videoscribe – allows you to create videos of a hand drawing the images and words that you require. It’s also pretty easy to use. Say Anything – like an electronic mini white board that allows students to type words and phrases that then scroll across the board. Mini white boards for the technological age! Goodnotes – this is a relatively new find for me. You use this app to annotate pdf documents, once again it’s very easy to use and completed documents can be shared via email or Google Drive. The basic version is free and so you are limited to how many notes you can create, £3.99 is the cost of the premium version. Pass Parcel HD – upload “forfeits” in the shape of questions to this app and when the music stops students unwrap their question. Tap Roulette – ever had arguments amongst students about who is going to go first? Now Tap Roulette can decide. Place fingers on the iPad, hit “pick finger” et voila! TuneIn Radio – various radio stations from around the world. Soundcloud – you can make your recordings private of public, you can email the link of the recording so that it can be shared. This app is also supported by a website which means that it is easier for students to access this from home. Recordium – this app is really cool at first glance but it does have its limitations. You can add notes to bits of the recordings and you can highlight sections of the recording, which would be great for giving feedback. However all of this has to happen in app and once you email the recording off the app you lose the notes and highlighted sections which is a shame. Croak.it – croaks are private. There is a time limit to how much you can say on a croak but this app is dead easy to use and would be great for use with KS3. DJ Spreaker – lovely, easy app to use which turns the iPad into a radio studio. My 7 year old loves using this app. Aurasma – make photos come to life using Aurasma. Great for creating talking walls. iPrompt – not a recording app but a really useful one which could help students when revising for their speaking controlled assessment. From iPad to teleprompter in one easy step. My final few apps are what I have classified as classroom management apps. I intend to go paperless this year and these apps will hopefully help me on my way. Lesson Planning from Teacher Cloud – is a really simple to use lesson planning app. I got this app for free but I think there is now a charge. There is also a premium version. Wunderlist – you can have this list making app on all of your devices including your desktop. You can also share lists. Class Dojo – I experimented with this behaviour/reward app last year but it didn’t quite work out for me however, having discussed with others how they use it, I am going to give it another go. So there we have it a list of apps for the new school year. If you have any must have apps of your own I would be really interested to hear from you. What’s your favourite time of day? One of my favourite times is when I’m hanging the washing on the line first thing in the morning. This usually happens at around 7 am, the world hasn’t quite got going and I savour the quiet hum of our village as it starts a new day. I try to take my time and relish the few minutes of quiet in which I cannot hear my kids squabbling or the noise of my husband unloading the dishwasher. I use my fleeting solitude wisely, I think about my day, what I’d like to accomplish and what I have to do or sometimes I let my mind wander in no specific direction at all whilst I carry out my seemingly mundane task. If I’m lucky hanging the washing out takes 10 minutes and then it’s back to the daily pre school chaos that I’m sure not only engulfs our household but many up and down the land. The thing is, I love peace and quiet, I love it when I can settle in my classroom during my PPA time with no distractions and get on and do something. On Sundays when I go kayaking, I can be paddling with upto 12 others but I love nothing more than silently paddling along listening to the rhythmic sound of my paddle in the water, the call of sea birds all around and to let my mind wander. Solitude is bliss for me and I treasure it. During one of my solitary moments this summer I engaged in another of my favourite activities; reading. I love to read and always have, during term time I tend to read less but in the holidays I love to relax with a good book – given half the chance I’d do it all day! This summer after I’d read all my chosen literature my husband suggested I read a book which did not appeal to me one little bit, it is called Quiet and it was written by Susan Cain. It has a subtitle – The Power of Introverts In A Word That Just Can’t Stop Talking. Those of you who know me would no doubt call me an extrovert so why on earth would I want to read this sort of book I asked myself, but in the absence of any other reading material at the time I reluctantly read it. It was un put downable. It was a real page turner and I am so glad my lovely hubs pushed me to read it and here’s why. Cain has clearly done her research, as her book is littered full of quotes from psychologists and scientists alike. Her premise is this; in an era of big business the world has become increasingly “extrovert”, introverts have been shunned in favour of the salesman with the big personality yet, Cain explains with clarity and conviction that the world now more than ever, needs introverts. Introverts often come up with the best ideas but these ideas are often drowned out by the noise of extroverts in meetings. Introverts are quiet people, who like to work in peace and solitude, it gives them time to think and process information, however we currently appear to live in a world where the group mentality is king. We increasingly work in open plan offices and our classrooms are often arranged in tables of 4 or even 6 to aide group work. Cain argues that for introverts these are difficult working conditions and more flexibility is called for so that both extroverts and introverts can get the best out of business or education and can equally feedback into those systems more successfully. We have all had to engage in the horror of brainstorming on an INSET day and we all know that those who speak loudest or most confidently generally hold sway. Cain argues that online working is a great arena in which both introverts and extroverts can successfully operate. Extroverts get a chance to express their views and introverts get thinking time to express theirs in equal measure moreover, the loudest voice isn’t the one that is necessarily heard and as a result better ideas are often formed. Both of these notions really stuck with me. I actually hate doing group work in my classroom as I have never found it to be that productive or in fact, something that students particularly enjoy. I do however have my classroom arranged in tables of 4, with some tables of 2 at the front. I find that this arrangement works well for speaking pairwork in the modern languages classroom, also it enables the students to help each other. I had not however, considered how this arrangement made my introverts feel and although there will never be a perfect solution to this conundrum I now feel that I have to take this new information into account when organising my room and some of my classroom activities. This year I have been experimenting with working online with my students and for the most part I have found it to be successful, yet until I had read Quiet I hadn’t really realised that it was mainly my introverted students that had contacted me via email throughout the academic year to discuss points about homework or classwork, but that is in fact the case. My extroverts on the other hand, like to to talk openly to me during class time. I have also produced a website for my students to use to practise reading and listening exercises they submit their answers to me electronically via the site. I guess, and it is only a guess, that the introverts among my class have preferred this method of delivery as it gives them time to think and consider their answers away from the pressures of the classroom. Given the things that I have leant from reading Quiet I intend to extend the use of online learning and discussion into the next academic year. By far the most incredible thing that I have learnt from reading this book is about myself. According to Cain, we are all to some extent introvert and extrovert, none of us is 100% extrovert or introvert, which I guess is a blessing. I am without doubt extrovert, but not as extrovert as you might think when you first meet me. As a child I was painfully shy, so much so that my parents really worried about it and sent me to a variety of after school clubs so that I could mix with others and exorcise my introversion! Over the years, I have learnt to be more extrovert. I love a party, but prefer it if they are small. I like to go for a drink in the pub but after a while I find that the noise gets to me and I have to go home. I love a chat but like to keep certain things about my family and myself very private. I love to read and spent a lot of my formative years “living in my head” as Cain calls it, wishing I was a member of the Famous Five. I get very nervous before speaking in public and when I was a Head of Year I got sweaty hands before every assembly that I delivered over a 5 year period. So you see, I am not that much of an extrovert I am just that person who loves to hang her washing out and get in touch with her introverted self whilst do so! This book was so startling, it made me think, it made me smile. I recognised myself, my husband, my family and my students in it and for those reasons alone I cannot recommend it to you enough! 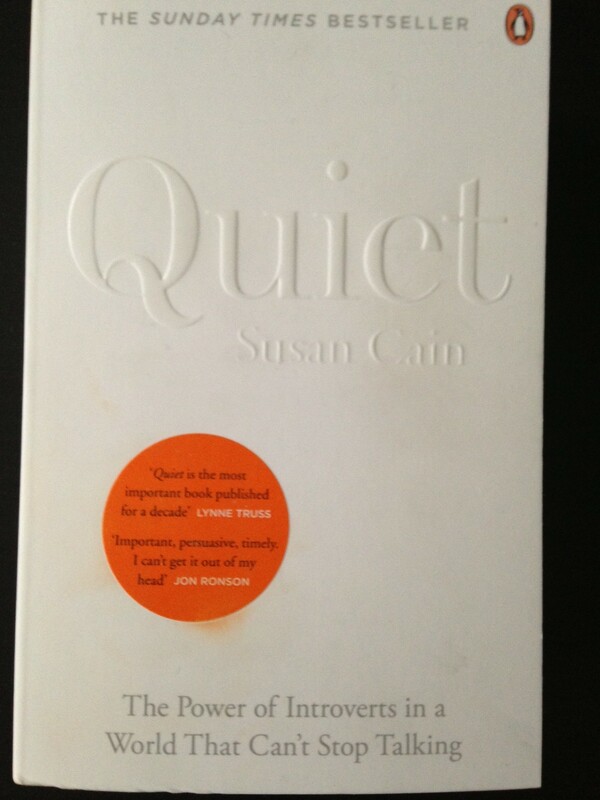 If you want to see Susan Cain in action talking about her book have a look at her TED talk here.